In addition to be being the first thing your employees and customers see, the entry door to your retail, commercial or industrial business serves numerous functions. Whether you need restricted security access, a welcoming design or simple high traffic functionality, the commercial door experts at Architectural Openings & Access can help you make a great first impression. AOA specializes in commercial doors and access solutions for a wide range of industries, including schools, institutional and government buildings, assisted living facilities, retail establishments, hotels and both large and small office buildings. Our commercial door technicians will assist you will all facets of your business door project — from concept and design to installation — ensuring that your investment will bring you value, function and piece of mind. We maintain long-standing relationships with some of the nation’s top commercial door companies, including the Steelcraft family of brands and OshKosh doors — respected companies which specialize in the commercial build environment. 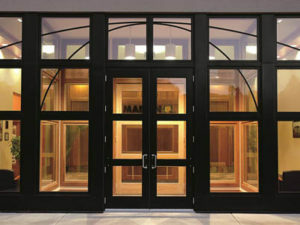 From replacement doors to new construction, we proudly stand behind our products and services 100%. For more information about the commercial door experts at AOA or to request an estimate for your entry, interior or security door project, please contact us here or call our office at 616-363-6854.